In 1990 a number of industrial fire officers in oil refineries in the United Kingdom decided that there was a need within the oil industry to meet regularly to discuss how to how to deal with Fire Safety matters within their Industry. An inaugural meeting, hosted by BP International, was held in the former Britannic House, London, England. At this meeting, attended by Richard Coates, BP International, Eddie Davies, Elf, Dave Murray, Conoco, Roger Marshall Lindsey Oil Refinery, Rob Wardle, Dow Corning and Trevor Thomas Gulf Oil, it was decided to establish an informal group which would be called the Joint Oil Industry Fire Forum (JOIFF). Eddie Davies of Elf Milford Haven, Wales was elected the first Chairman of JOIFF and Trevor Thomas of Gulf Oil Milford Haven, Wales, took on the role of Secretary, positions that they held for three years, until they were duly replaced, Gary Douthwaite of ICI taking over from Eddie and Rob Wardle of Dow Corning from Trevor. The initial objective of JOIFF was to build a forum of fire chiefs to discuss matters relating to Fire and Explosion Hazard Management specifically in the Oil Industry. As time progressed, the value and potential of JOIFF was recognised by fire officers from high hazard industries outside the oil industry – the Chemical, Pharmaceutical, Aviation and other related Industries. Municipal Fire Brigades with responsibility for attending incidents in Hugh Hazard Industry also began to see the value of becoming engaged with JOIFF. To allow membership of organisations from these sectors, the name of JOIFF was changed to the Joint Oil & Industry Forum. Throughout the 1990s and into the new millennium, the membership of JOIFF grew, not only in the number of member organisations and the range of industry/commerce sectors in which they are engaged, but also in the number of Countries in which JOIFF member organisations were located. This resulted in a much wider based involvement in the activities of JOIFF and to truly reflect the nature of the membership and range of interests of JOIFF, the name of the Organisation was changed once again this time to “JOIFF: The Organisation for Emergency Services Management”. As JOIFF has continued to grow in numbers and in influence, today the name and title of the organisation is “JOIFF: the International Organisation for Industrial Emergency Response and Fire Hazard Management” – or simply “JOIFF”, the name by which the Organisation is now well known. 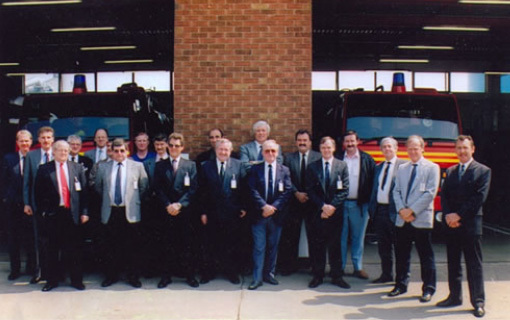 During the 1990s Fulcrum Consultants, a Company based in Dublin Ireland and at the time, part of the GD Group, a long established Group of Companies engaged in the fire safety industry, worked with JOIFF members on various activities related to emergency response. This work led to highlighting the absence of minimum standards of training whereby emergency responders to incidents in industry could obtain internationally recognised certification of competence. In 1999, JOIFF and Fulcrum Consultants formed a Working Group to develop such a system of accredited competency based training for emergency responders to incidents in industry, particularly in High Hazard Industry. The first JOIFF accredited training courses took place during December 2000 resulting in the issue of the first JOIFF accredited certification. In the following years, the system of JOIFF accreditation of training has been developed and there are a growing number of JOIFF accredited Training Establishments around the World. At the beginning of 2001, Fulcrum Consultants, which became an independent Company in 2005, were invited to become the Secretariat of JOIFF and has worked with JOIFF since then and has driven JOIFF into the major International Organisation that it is today with Membership spanning across the World. When JOIFF was first established a logo for JOIFF was designed by Rob Wardle, then Secretary of JOIFF, and Simon Peake when they both worked together in Dow Corning, Barry, Wales. The logo was designed in three stages. The arrows in the background were chosen and coloured in green to represent what was eventually to become the European standard colour for “safe conditions”. Even at that stage, the founders of JOIFF were aware of the need for Mutual Aid in the event of a major Incident involving Industry and the designers chose the four green arrows facing outwards to highlight the effect of four white arrows looking inwards to represent other member companies coming to assist in the event of a major incident. The building structures were then added to the background to represent the structures of the original JOIFF member companies. These were not coloured because the designers did not want to detract from the green background. The flame, which was coloured to add realism, was added as were the four words, “anticipate”, “evaluate”, “control”, “respond” on each side of the logo. Because the type of software available today for reproduction of pictures was not available in the early days of JOIFF, the presence of the words caused difficulties in reproduction of the logo. As the Membership and operation of JOIFF grew during the 1990s and there was a growing need to use the logo in notepaper, brochures etc. it was decided to remove the words around the picture to assist in the reproduction of the logo. The JOIFF logo was made available as a lapel pin which Emergency Responders and others working in JOIFF member organisations wear with pride. To mark the 20th anniversary of JOIFF the Logo underwent a further revision – a radical move away from the well known square design to a sphere. The change better reflected JOIFF’s growing influence around the world. The industrial backdrop and flame have also been modified, however, the green and white arrows have been retained and are now shown wrapping around the globe in an embracing fashion.